The pottery we saw was as varied as you could imagine, and all of it stunning. We were given a guided tour through the business premises - another man-made cave carved out of the soft Cappadocia rock - while the various cousins, brothers and other relatives worked on oblivious to our presence while plugged in to their personal stereos. We watched as they applied the most intricate details to some incredibly detailed pieces of art (for that is what they were). 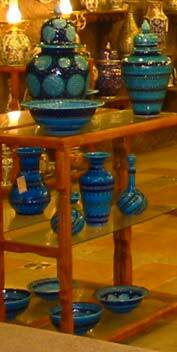 The ceramic style is known as Iznik and the top artists in the family were referred to as 'the masters'. On the wall of one of the master Iznik craftsmen were press cuttings of him meeting various dignitaries of the government and other celebrities. These are more than mere potters! From one master we went to the other extreme - Louise, picked to have a go on the 'kick wheel' at making a pot of some kind. As she quickly proved, making such pieces of pottery is not an easy task; giving the group a laugh at her attempts at keeping the clay under control was a much easier task. A few of the group decided that they would buy a piece from the items for sale, and having seen the amount of work that goes in to creating these plates, pots and so on, it was clear that this was quality merchandise. Naturally, it came with a higher price though! We then moved on to the Göreme Open Air Museum. While the whole area of Cappadocia has rock-cut dwellings of a number of shapes and sizes, the collection in Göreme is perhaps the finest of examples. 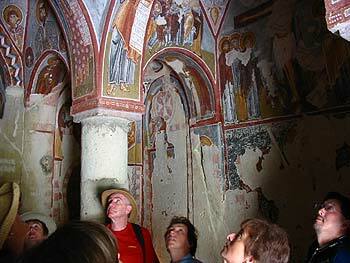 Here there are chapels, carved out with the necessary arches, which have friezes showing Jesus, Mary and John the Baptist, among others. Some have been painted directly on to the rock, others on to plaster. Despite the rough surface, the paintings are very clear, even given the amount of deterioration over the years with chunks missing. Each frieze was explained to us by our guide for the day, Murat, who was the youngest guide we'd seen so far at just 24 years old - and he had been guiding for seven years already.